At first glance, a 28% increase in Toronto home sales could make anyone believe the worst is over. But it's not. The fact of the matter is that the average home price in the City of Toronto actually went down by 0.9% during the first two weeks of September. And this is just the beginning of the good to come. After all, who doesn't want to have more affordable housing? Still the sales rebound is impressive. But there is a reason for it. About a year ago Ottawa changed mortgage rules which put downward pressure on the housing market and resulted in crashing sales. Fast forward to today and the rising mortgage rates force the insecure public to jump into the market due to the fear of higher rates down the road. 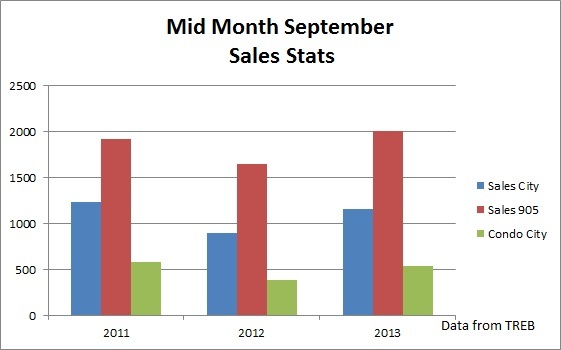 So, if you compare recent sales to a year ago, no wonder you see dramatic increases. 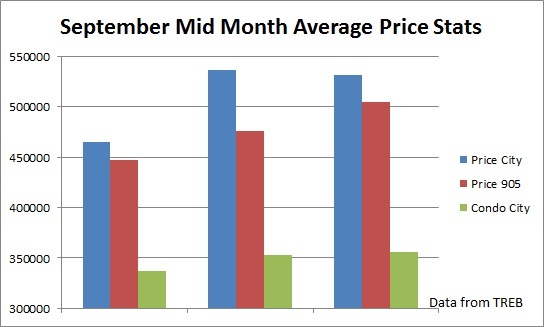 If you compare the home sales to 2011 you get a net decrease of 6.6%. Now let's dig a little deeper and take a quick look at certain market segments. 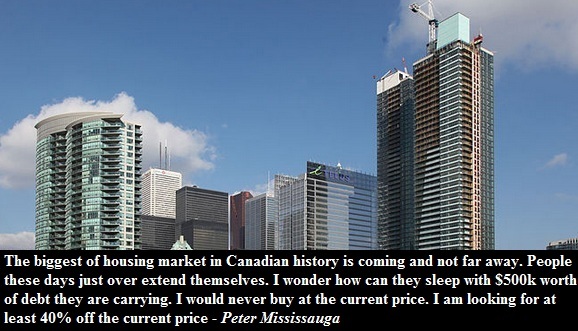 Detached prices in the City of Toronto are up by the whole 0.2%. That's quite an increase, isn't it? 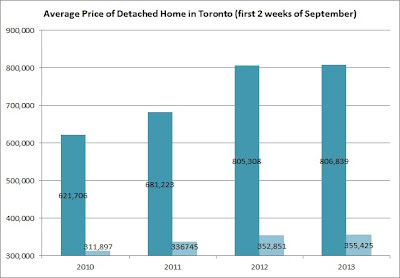 In comparison, during the same period of time in 2012, detached home prices in Toronto went up by 17%. That's quite a slow down of housing price inflation. Sales of detached homes in the City of Toronto are up by 27% compared to a year ago but down 5% compared to 2011. Condo-wise, sales are up by 38% while prices are up by mere 0.7%. If you compare condo sales in the City of Toronto to two years ago, they are down by almost 10% during the first two weeks of September. All in all, the sales upswing is nothing but a dead cat bounce.